In what has been their best effort to date in this turnaround season, the #8 Quinnipiac Bobcats shutout the #1 UMass Minutemen 4-0 before a rocking crowd at the Frank Perrotti, Jr. Arena behind a sensational 32 save effort from junior goaltender Andrew Shortridge. The win gave head coach Rand Pecknold his 499th win as he will take his team up I-91 and into the Mullins Center Saturday night looking for the number 500. The arena, which was loud and reminiscence of what we saw in the 2015-2016 when the team reached the Frozen Four saw the roof blow off just 42 seconds into the game when Wyatt Bongiovanni found a rebound in front and ripped one past Filip Lindberg. 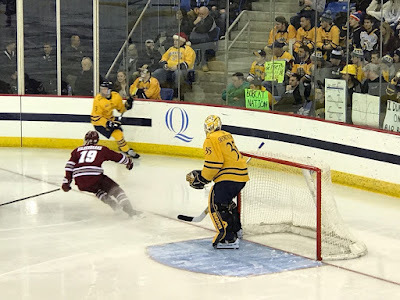 Quinnipiac scored again in the second period when Joe O'Connor from behind the end line found a driving to the net Zach Metsa who buried it past an out of position Lindberg. Shortridge however was the star of this game with several clutch saves in the second period to keep Quinnipiac ahead in this game. The junior improved his record to 6-0-0 with a .83 goals against average and a .966 save percentage this season. He also recorded his second straight shutout and third of the season giving Quinnipiac its sixth shutout in 16 games played this year. 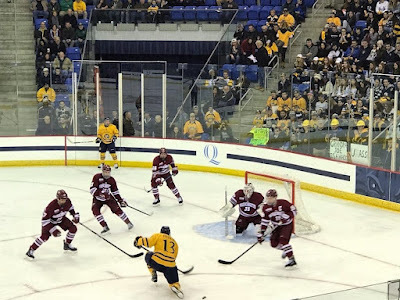 Quinnipiac pushed the game just about out of reach when Alex Whelan's strong forecheck along the end wall won a battle for a loose which led to a centering pass to Craig Martin in the slot who roofed it over Lindberg. Martin scored an empty net goal to cap the scoring for Quinnipiac. With its seventh consecutive win, Quinnipiac moved its season record to 14-2-0 (6-2-0 ECAC) and up to fourth in the ever important pairwise rankings. These two teams now head north to Amherst, Massachusetts and to the Mullins Center for a white out game as Quinnipiac looks to sweep the weekend series and lock down the 500th win of Rand Pecknold's career as they head into the first semester break.